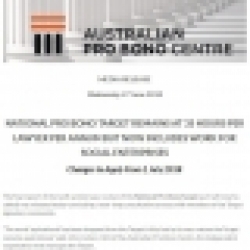 The Australian Pro Bono Centre has released new changes to the National Pro Bono Target, effective 1 July. Following a year-long consultation process with members, the centre has concluded that the National Pro Bono Target will remain at 35 hours, per lawyer, per annum but will now allow work completed for social enterprises to count towards total target hours. Legal disputes could be fought entirely online in a state government pilot program that includes a world-first trial hoped to ease pressure on courts. The online dispute resolution scheme is tipped to be part of a suite of measures included in NSW’s Civil Justice Strategy, for which the government has announced $7 million in funding over the next four years. Allens, Ashurst, Clayton Utz, Colin Biggers & Paisley (CBP), Gilbert + Tobin (G+T), Hall & Wilcox, HWL Ebsworth, and Sparke Helmore have partnered with the NSW Coalition of Aboriginal Regional Alliances (NCARA) and will provide pro bono legal work to eight Aboriginal regional alliances. Read what the pro bono coordinators had to say about the involvement of their respective firms. An “unusual and novel transaction.” That’s how WWF-Australia CEO Dermot O’Gorman described the latest pro bono legal work that the Allens team assisted on. The not-for-profit organisation was awarded $50,000 by The McCusker Charitable Foundation, a gift it says will bolster its ability to service Western Australia’s most vulnerable people. Balit Ngulu was launched by the Victorian Aboriginal Legal Service (VALS) in July last year. It was born out of frustration, after the service had to launch a court challenge to have children taken out of the adult Barwon Prison. But a year on, the small Broadmeadows-based centre is threatened with closure because its funding is running out. Sometimes vulnerable people need a lawyer, but are more likely to talk to a health professional. It is an observation that forged a partnership between the Loddon Campaspe Community Legal Centre and the Bendigo Community Health Service in 2013, embedding a lawyer with health professionals. 48 years ago, Sarah Weddington, then a 25-year-old attorney who had only worked on a few uncontested divorce cases, took on a pro-bono case involving a young Texas woman’s unsuccessful attempt to legally obtain an abortion. Weddington would go on to argue the case, Roe vs. Wade, in front of the Supreme Court and change the course of American history. Legal departments, even those at major companies, often avoid using their lawyering talents to serve any client but their corporate client. But not 3M Co. Ivan Fong, the company’s general counsel, finds that doing pro bono work is an important way for the 260 lawyers he supervises around the globe to gain solid experience doing interesting legal work while supporting their communities at the same time. Uber is exploring how its legal team can assist migrant families affected by President Trump’s hardline immigration policies, and has donated $100,000 to a non-profit supporting migrant children, according to an internal company memo. The Law Society of Singapore says there has been a 70 per cent increase in the amount of pro bono work done over the past three years. But while there has been greater access to justice, some lawyers tell Tan Si Hui that people have been “gaming the system”. John VanBuskirk was in his late 60s and settled into retirement when he saw that a new law school was opening in downtown Dallas. So he applied. And he got accepted. Now, a little more than four years later, VanBuskirk, at 71, is a new member of the State Bar of Texas. In January, he was the oldest graduate in the inaugural class at the UNT Dallas College of Law. It’s encouraging to see that a pro bono champion has been recognised as a legal innovator by the Financial Times! Annette Bain, pro bono counsel at DLA Piper, has an impressive record in spearheading initiatives improving access to justice as demonstrated in the brief bio on her in this article. Law firms are turning to emerging legal and regulatory technology to benefit programmes for access to justice and rule of law in the Asia Pacific region. This outreach is helping to accelerate the use of technological tools that firms say will be critical to practising the law of the future. This article feature a RACS-Thomson Reuters-Gilbert+Tobin initiative to improve the processing of asylum applications.